No, I’m not talking about those drawers, silly. I’m talking about the drawers I need to build for the nail cabinet. The drawers in the original are faithfully reproduced in the article, and the construction is a bit odd. 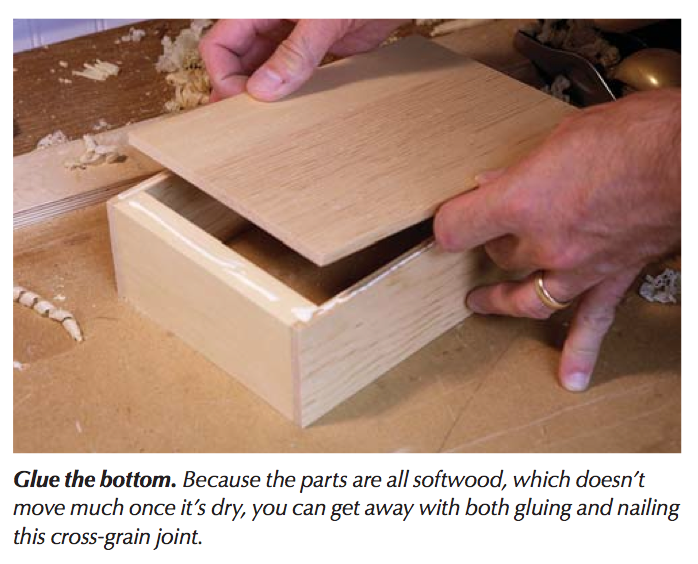 Instead of dovetails, rabbets, tongue-and-groove or any of the other standard drawer construction methods these are build by gluing and nailing the sides and bottom the the edges of the front and back. I thought (briefly) about dovetailing them instead. I also thought about veneering the front to cover the exposed end grain, or perhaps running a rabbet around three sides. In the end I’ll probably just follow the instructions in the article for the experience. I was concerned about the door (which has glued and nailed miters) being too wimpy, but it turned out OK. My test joint took a fair amount of force to break (albeit still way less than other construction methods), so these will probably be OK too. The first step to making the drawers is to prep the stock. 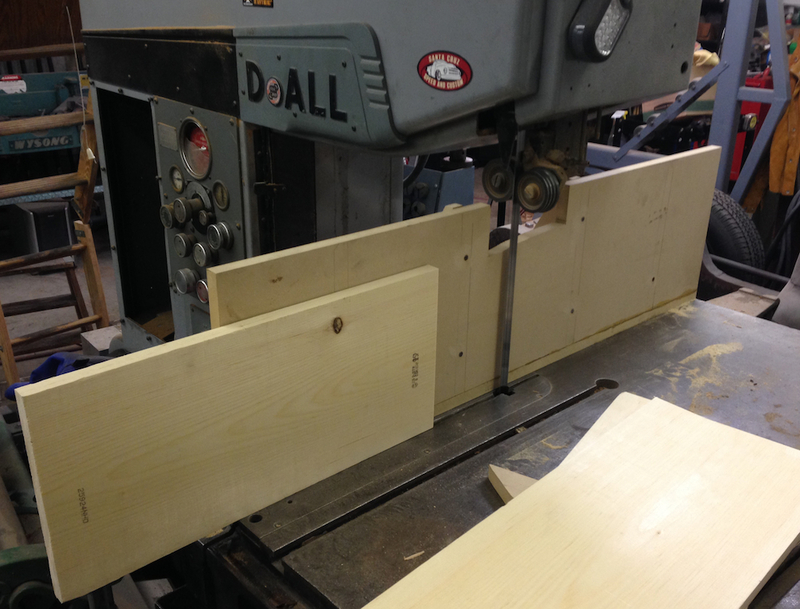 I didn’t want to plane 3/4″ boards down to 1/4″, so I decided to try re-sawing first. I’ve mostly used my bandsaw for metalworking (it’s in my metal shop after all), using it to cut out profiles in plate stock. I have it fitted with a fancy re-saw blade from Highland Woodworking, and it has a 7.5 horsepower motor, so it should be up to the task. I dropped the gearbox into high, turned up the speed and dialed in the blade tension (I still need a bit more I think). Everything on this WWII era saw is hydraulic, the blade tension, the post height, table angle, table feed (yes table feed, so you could clamp something to the table and feed it through the blade), blade tracking and fine speed adjustment. Crazy right? The tension was making me nervous because I had to turn it up a lot higher than I usually do, and the adjuster was making some odd noises. Maybe the gauge needs to be oiled or something. It took several adjustments of the (cobbled together) MDF re-saw fence to get the tracking right, but I was able to re-saw these 1×10 pine boards into half without too much drama. 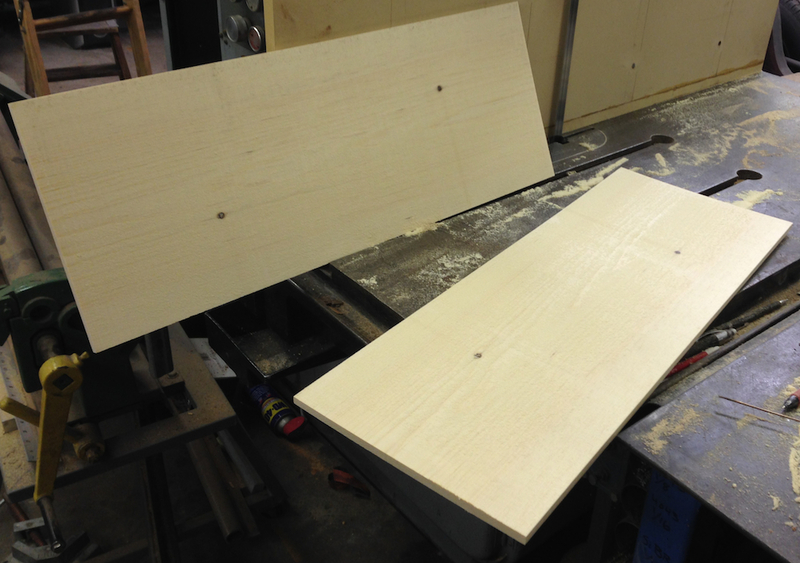 The boards were slightly cupped to begin with, and supped even more after re-sawing — I expect from releasing stress. I was afraid if I flattened the stock before re-sawing I’d have to flatten it again, I’m pretty sure that’s accurate. Then I jointed and planed the re-sawn boards (including my experiments on scraps) into 1/4″ boards, and left them stickered to acclimate. I think “acclimate” is a five-dollar-word that means “trying to warp”. I probably need 3 or 4 times this amount to make the drawers, so I’ll get out to the shop one night this week I hope to finish the stock prep job. I have enough Alder scrap that I’m thinking of using that for the drawer fronts. I’ll do one drawer as an experiment and see how it comes out. Right now I need to get my teenage son out of bed and off to school, which is way more challenging than making drawers.